On the first day of November, the worlds of art and hospitality will collide at Grub Food Van as it reveals a large-scale mural Bacchus and Ariande by Melbourne-based painter Steve Cox. The mural has been commissioned to coincide with the launch of Grub’s new summer menu. Grub is making an annual custom of allowing artists to repurpose the space. Last year Rosslynd Piggott was commissioned and the greenhouse was alive with blossoms, bubbles and Japanese pop music. Steve Cox is a Melbourne-based painter with a long and illustrious career. He has held over 40 solo exhibitions and has been included in more than 50 group exhibitions. He has been a finalist in both the Dobell and Sulman Prizes and his work is held in the collections of a number of prominent galleries – the National Gallery of Australia, The National Gallery of Victoria and The Benalla Art Gallery to name but a few. The mural at Grub will be Steve’s third major mural project, which is inspired by Titian’s great masterpiece Bacchus and Ariadne. The painting has always been a favourite of Cox’s, focused around the themes of feasting, drinking, and love – which makes it naturally suitable for Grub’s main greenhouse space. The ping pong table will also be incorporated with references to the main work – this as part of the tradition of Grubs’ table-tennis table being commissioned by local artists and then being auctioned for proceeds to be donated to local schools. The composition of Titian’s artwork is divided into two triangles, one of the blue sky and the other in shades of green and brown. Cox has kept to these specific background structures, but still takes certain liberties with the arrangements and stylisation of the figures. Cox also adds striking spatial devices to hold the picture together across Grub’s generous wall space. 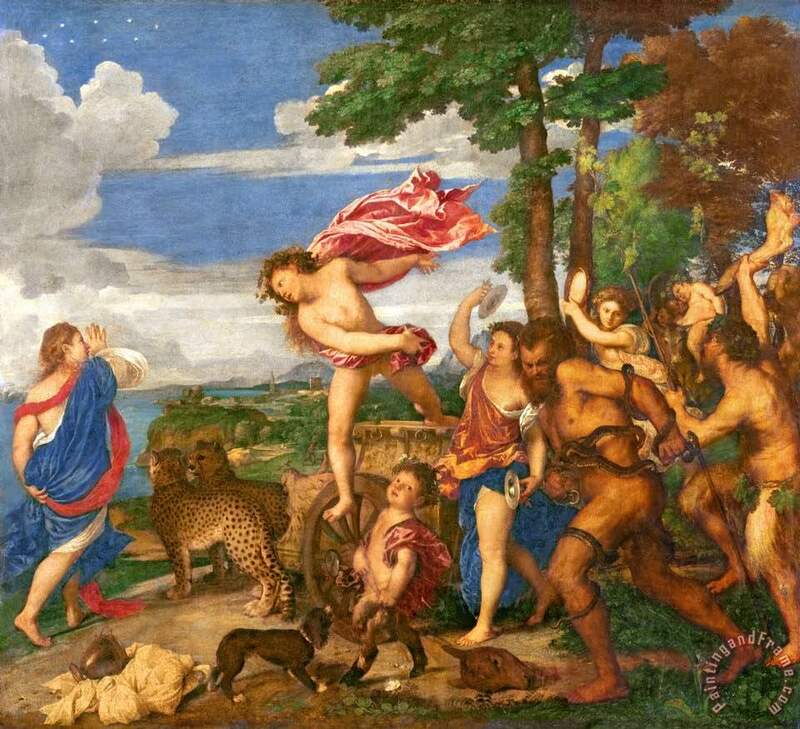 Titian’s painting, considered to be among his greatest, was commissioned by the Duke of Ferrera in 1523 and is currently on display in the National Gallery, London. It is based on the Greek myth in which Ariadne is deserted on the island of Naxos by her lover Theseus. She is surprised by the god Bacchus, the god of wine, feasting and revelry, who arrives on the shore with his band of mythological creatures – fauns, satyrs etc. At the front of the procession is a chariot, drawn by two cheetahs. Bacchus falls instantly in love with Ariadne. He throws her crown high into the sky, where it becomes the star constellation Corona Borealis (Northern Crown).